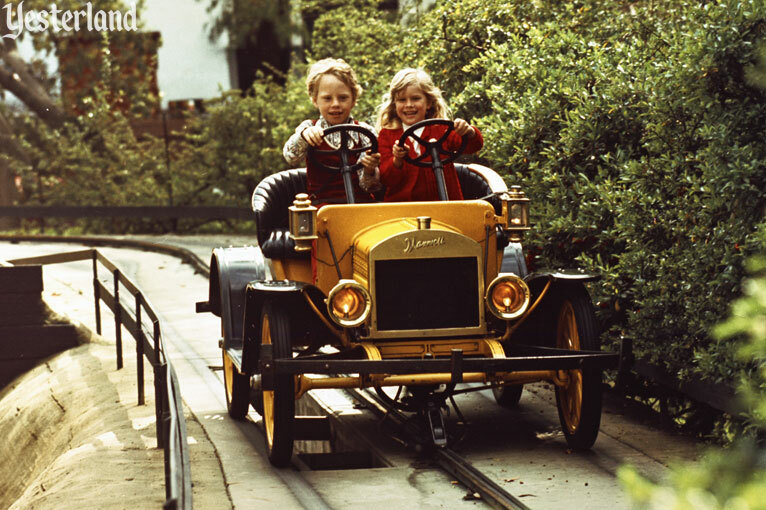 Yester Knott’s Berry Farm gives you a choice of antique automobile rides. There’s Henry’s Livery, in a far corner of a parking lot. That’s where you drive gasoline-powered cars on a track without a center rail. The ride lacks scenery, unless you count Beach Blvd. and parked cars to be scenic. And then there’s the Antique Auto Ride, right next to the authentic Dentzel Merry-Go-Round. The electric cars run along a center rail, so there’s no need to steer. The track winds through a contoured, landscaped setting with scenic buildings and props. The Antique Auto Ride has a fleet of two-passeneger roadsters, inspired by the 1906 Maxwell Gentleman’s Speedster and the 1910 Ford Model T Runabout. The scale is 3/5. When a car’s radiator has a rounded top, look for the Maxwell logo on it. On a radiator with diagonal angles, look for the Ford logo. Unlike real Maxwells and Fords, there are two steering wheels on each car. Kids won’t fight about who gets the steering wheel. In this regard, it’s like the Midget Autopia at Yesterland. 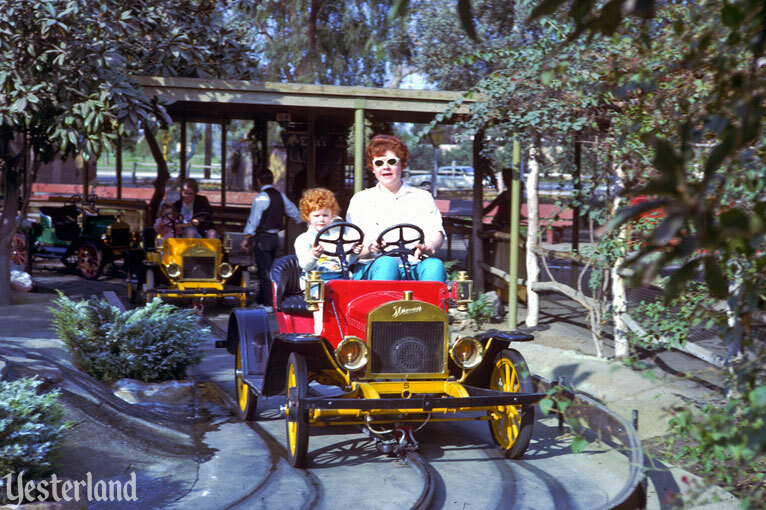 The Antique Auto Ride had three names at Knott’s Berry Farm. 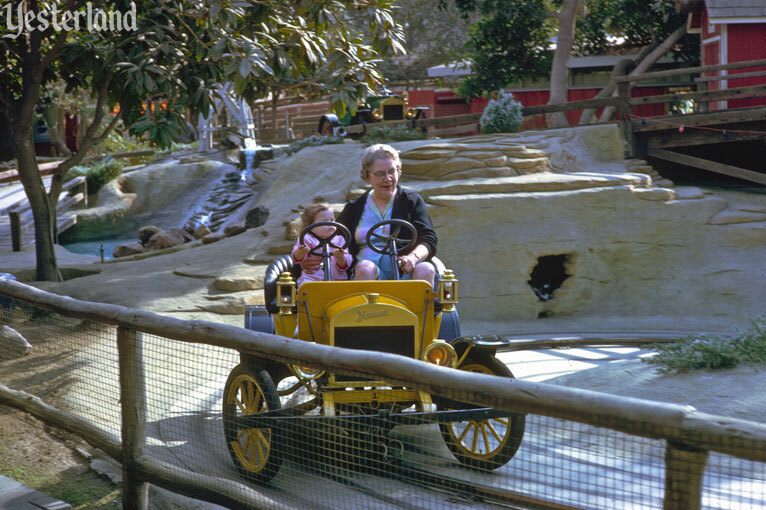 When it opened in 1958, it was called Merry Go Round Auto Ride. 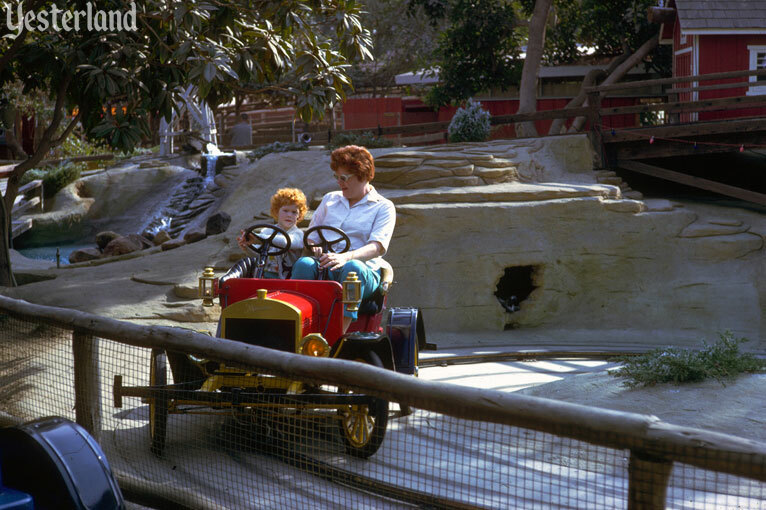 Hurlbut’s second ride at the Farm, the Merry Go Round Auto Ride was adjacent to his first ride—so the name made a certain amount of sense, even though the auto ride had nothing to do with merry-go-rounds other than proximity. Hurlbut looked to the Arrow Development Company for the cars. This was the same company that had designed and manufactured various ride vehicles for Disneyland, sometimes working closely with Disney Imagineer Bob Gurr. 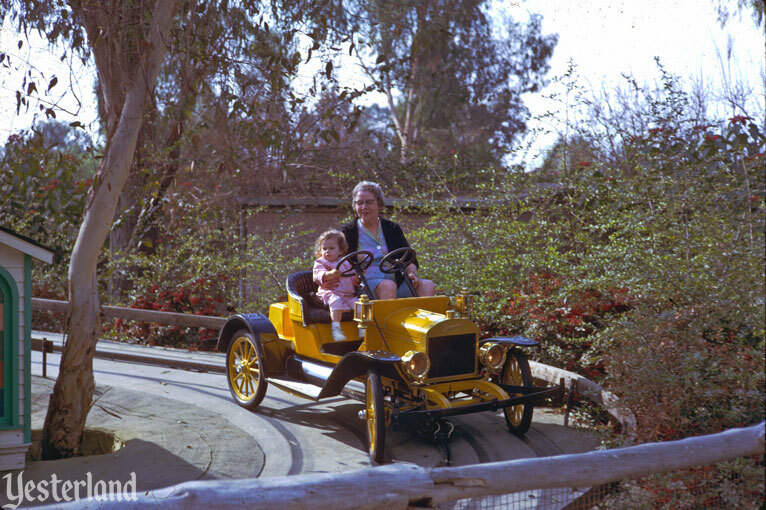 The antique cars were “off-the-shelf,” but Hurlbut had bigger plans for the ride. In the later 1960s, it was renamed Antique Auto Ride. Although rather generic, it described the ride better than its original name. 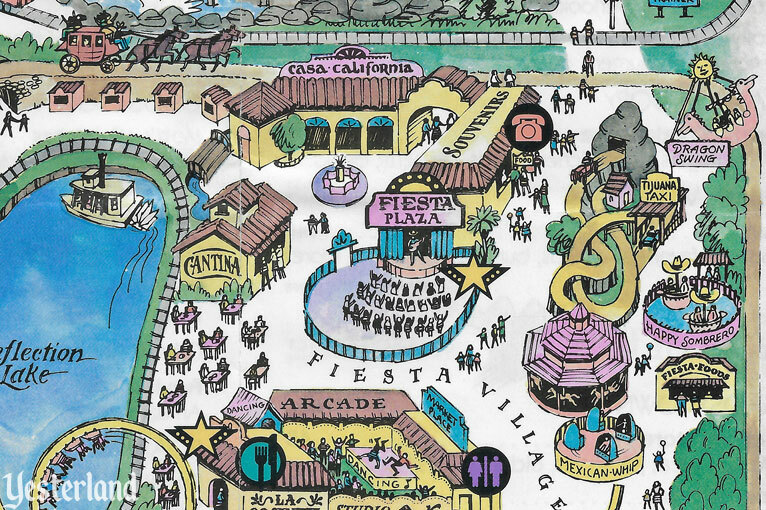 In 1969, the Knott family rethemed the northern end of their park to represent the Mexican heritage of California. 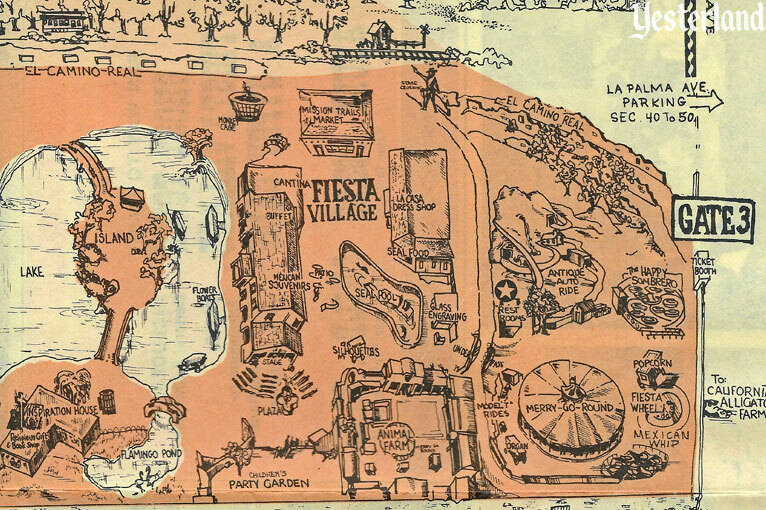 What had been an unthemed hodgepodge of concessions was unified as Fiesta Village. Some of the names in the area changed. But the auto ride remained Antique Auto Ride. 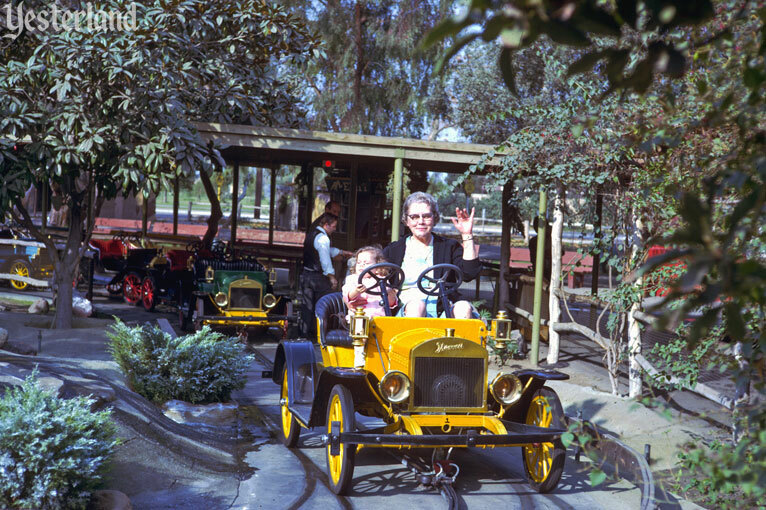 In 1976, the ride received its third name—Tijuana Taxi—probably based on “Tijuana Taxi,” the 1965 hit record by Herb Alpert and the Tijuana Brass. Hurlbut sold his attractions at Knott’s to the Knott family in 1984. 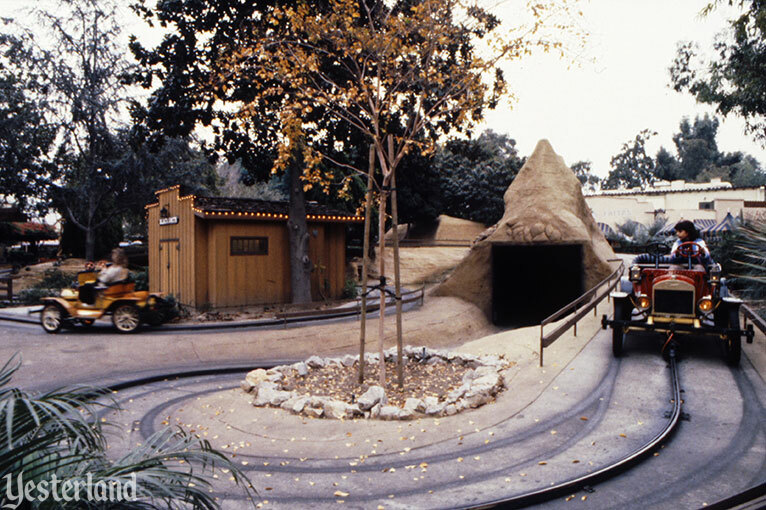 To prepare Fiesta Village for more exciting rides, Knott’s removed Tijuana Taxi in 1986, along with Fiesta Wheel and Mexican Whip. 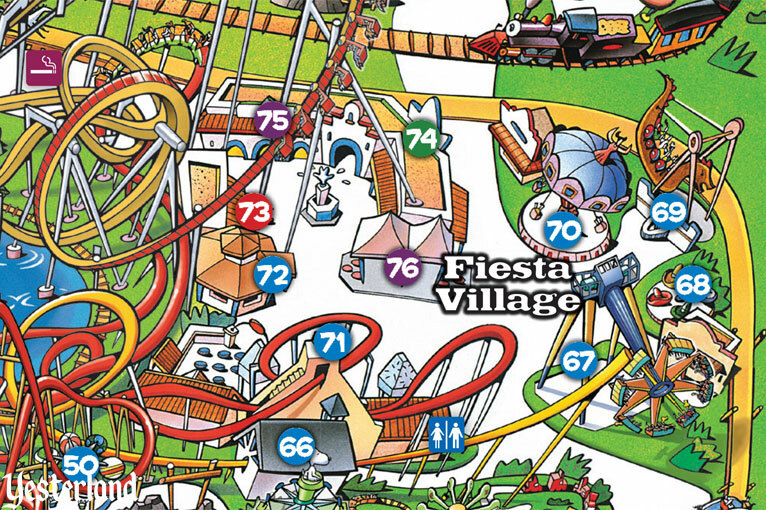 The following year, Slingshot (renamed Waveswinger in 1998) opened roughly where Tijuana Taxi had been. 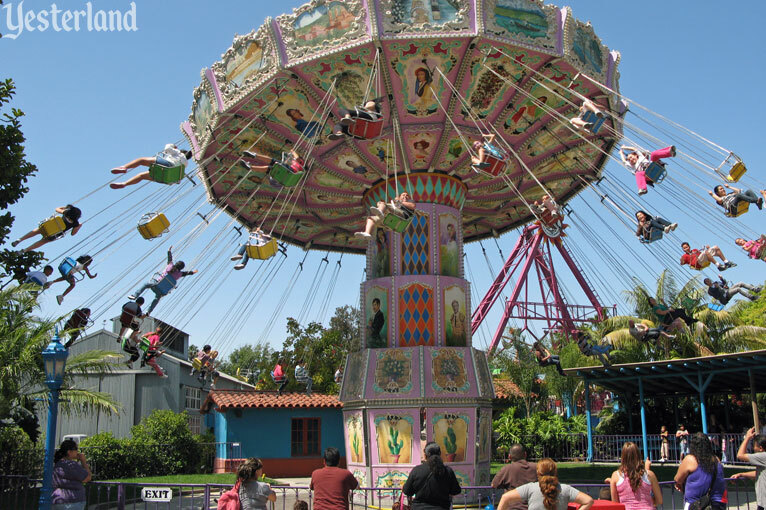 Meanwhile, Bud Hurlbut had acquired his own amusement park, Castle Park in Riverside, California. 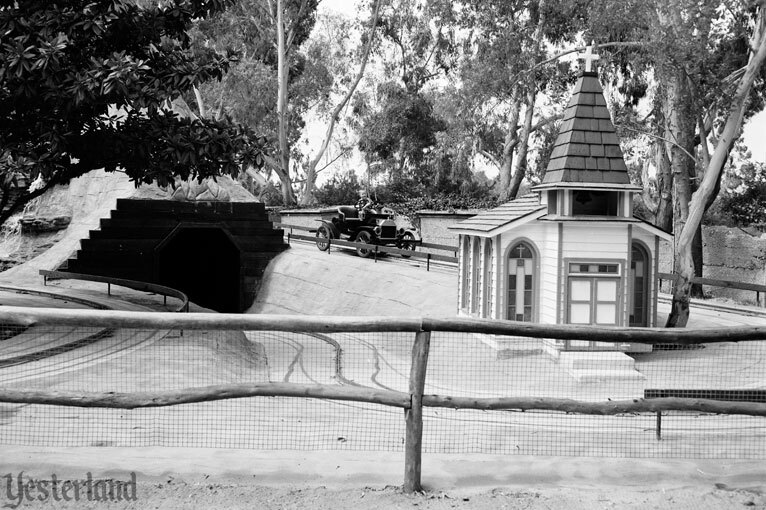 It had opened in the mid-1970s as a miniature golf course and game arcade, but Hurlbut transformed it into a full-fledged family amusement park. He sold the park in 1999. 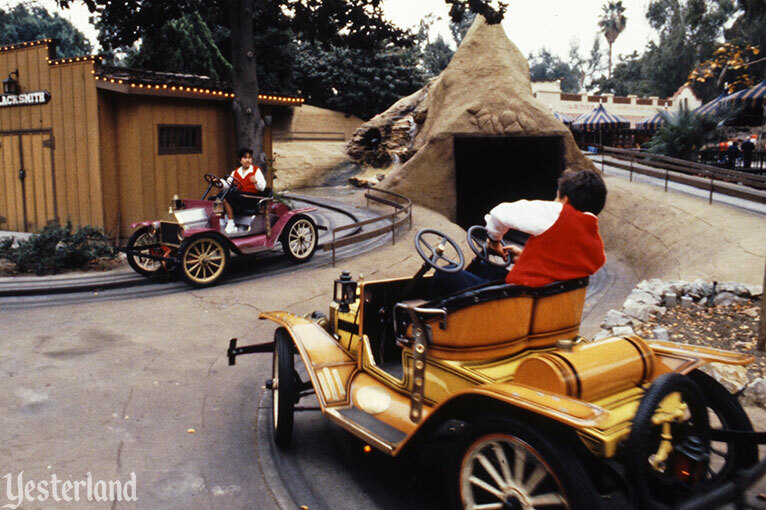 As we come to the end of this article, it’s time for a confession… The Antique Auto Ride hasn’t really gone to Yesterland. The ride is still going strong after almost 50 years. 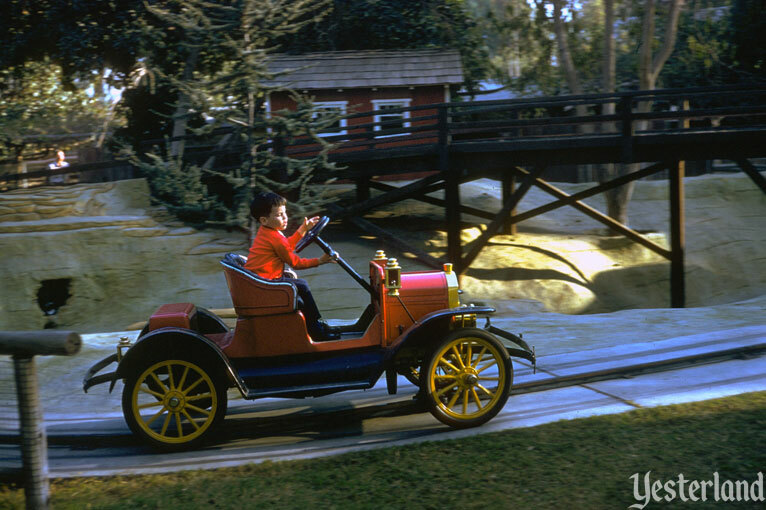 There’s yet another generation of kids driving their 3/5-scale antique roadsters through the Bud Hurlbut-designed landscape. However, the Antique Auto Ride is now at Castle Park in Riverside.